On Sunday I found this video of the Shrewsbury gasometers taken shortly before they were demolished in 2009 but never posted due to the low quality. The video was taken from the window of the Metrolink blue line on a rainy late afternoon. After re-discovering the video, I was thinking I should head up to Natural Bridge and photograph the last one of these structures left in St. Louis. Then Tuesday I saw the Preservation Research Office post announcing that the last one is currently being cut up into small pieces. 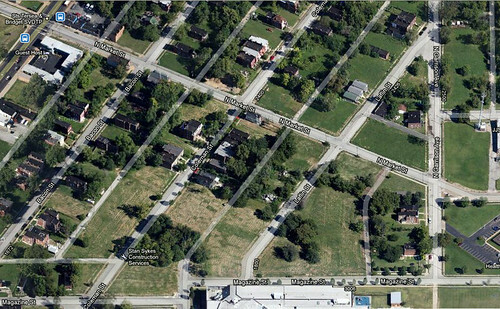 One of first posts on Vanishing STL back in January 2007 was about the gasometer at Chouteau & Newstead that was taken down that May. Currently a complex of very bland apartments that look like they belong in Ballwin are going up on that site. 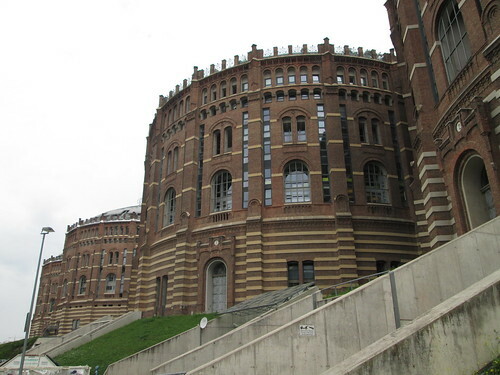 In the 2007 post I featured an example of four historic gasometers in Vienna, Austria that have been rehabilitated with new structures built within. 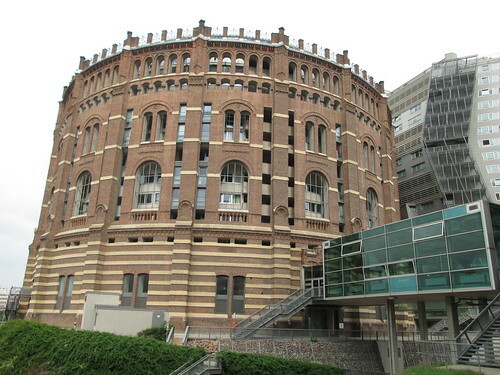 This past August, I had the pleasure of visiting Gasometer City in person! The exterior brick shells combined with new contemporary structures built within is quite pleasing. 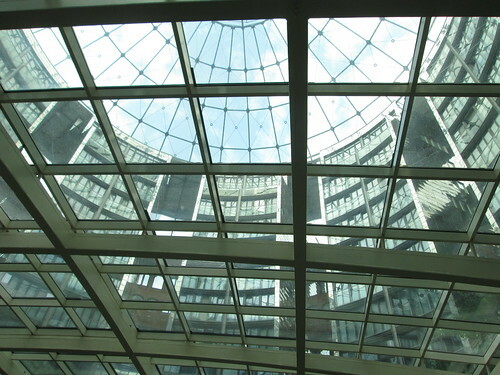 I was unable to see the residential floors as they are secured for residents only, but was able to view them through giant skylights at the first level. 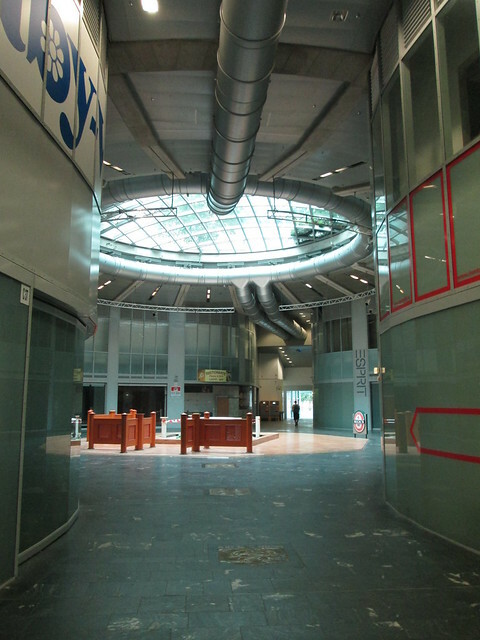 The first floor spaces resembled an american shopping mall with a series of retail spaces encircling center atria and connected together with glass bridges between the gasometers. 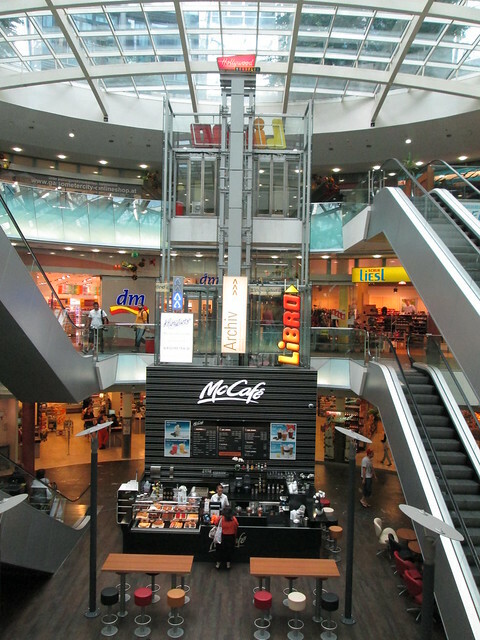 The end closest to the U-Bahn station had three levels of commercial space with a mix of retail, restaurants, fast food and a small grocery store. 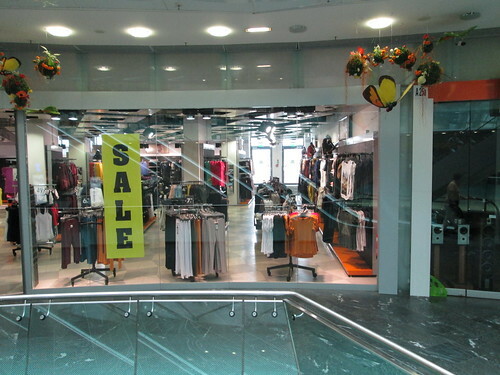 One of the retail spaces at the tri-level end of the complex. Two of the retail atria at the other end of the complex that was completed between 1999 and 2001 however resembled an american dead mall with completely empty storefronts. 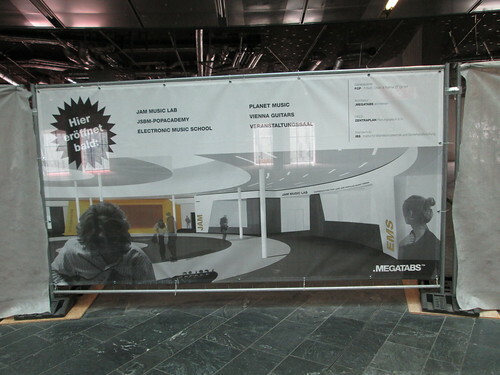 The fourth atrium retail area which is closest to the tri-level end is currently being completely remodeled into music themed spaces. Flanking the re-purposed historic gasometers on one side are a series of odd green colored housing blocks scattered randomly on re-clamed industrial land. The lack of good urban design surrounding the gasometers is disturbing and along with the isolated inward facing design, could help explain the lack of life at the commercial level. 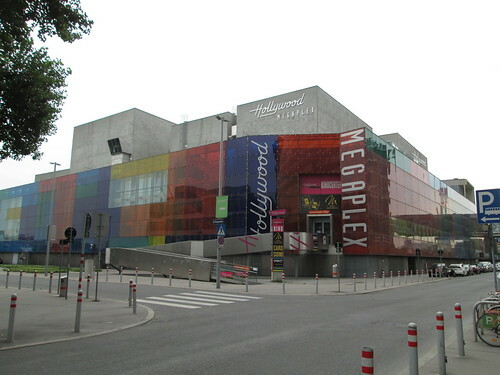 On the other side is a giant movieplex with large blank walls facing the streets. While the re-use of the beautiful historic brick gasometers is highly commendable and seemingly successful from the residential standpoint, the failed mall and surrounding areas show that European cities are not immune from the planning mistakes that are so common in the US. Back here in the Brick City, our gasometers were made of steel instead of brick, so no shells existed to insert new structure within like what will need to be done in order to save Cupples Warehouse #7. The steel frame of our gasometers was structured to carry only the weight of frame members above and the thin walls of the giant segmented tanks which would rise and fall with the pressure of gas pumped into them, but not to help carry the weight of a new structure within. 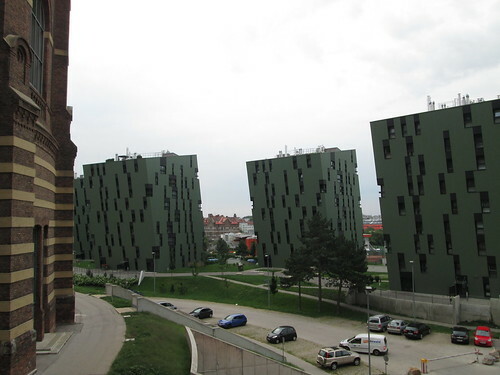 This does not mean that the structures could not be incorporated in new development, but the assumption was made with three different locations here that no one would want to bother. 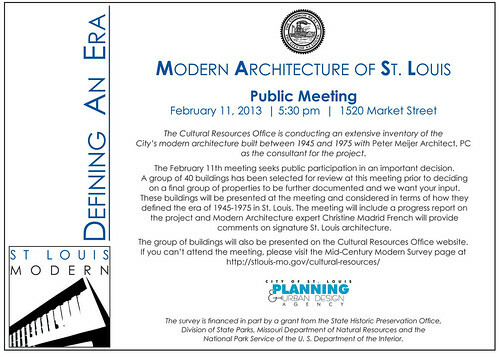 The City of St. Louis Cultural Resources Office is seeking public input regarding the selection of buildings for further documentation as part of an architectural survey of modern architecture that is currently underway. A public meeting is being held on Monday, February 11th at 5:30 pm in the 2nd floor hearing room at 1520 Market Street. The intent of the survey is to determine which modern era buildings in the City of St. Louis are eligible for listing on the National Register of Historic Places and/or eligible for designation as a City Landmark. Either designation would trigger a review by the Cultural Resources Office if a demolition is proposed and National Register designation would make substantial rehabilitations eligible for Federal and Missouri State Historic Rehabilitation Tax Credits. Andrew Weil, executive director of Landmarks Association points out in an NPR story about the grant, that the demolition of the San Luis Apartments on Lindell Boulevard focused attention on the fact that many modern era buildings in St. Louis lack of any protection from demolition. Yesterday I got an unexpected tag on Facebook from Toby Weiss informing me that Vanishing STL had been awarded Best Activism/Opinion Blog for the 2013 RFT Web Awards! I was quite surprised. I knew that I was a finalist, but had not made it to the awards ceremony on Tuesday evening, and I really had not had any expectations of being selected. Thanks to the judges at the RFT! Toby, by the way, won Best Architecture Blog for her awesome work on B.E.L T.
The comparison the RFT made to Sarah McLachlan's abused pet commercials is pretty spot on. I've been told several times that I publish the most depressing blog in St. Louis and my reaction is usually: Yeah, someone has to do it. Although the last sentence I would somewhat disagree with: What treasures are we destroying in the name of innovation? 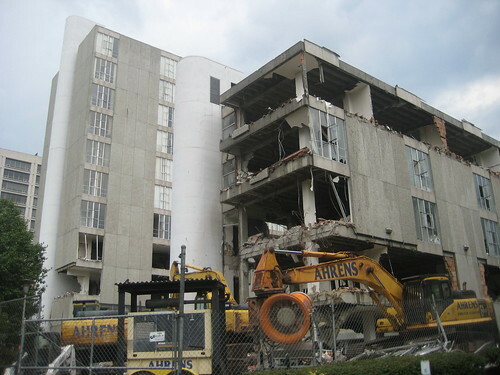 When a building gets knocked down for something that is innovative, I usually do take note, but I don't find parking lots, parking garages, fenced Biondi lawns, CVS or gas stations to be "innovative". I find it interesting that all of my fellow finalists also write about the built environment in St. Louis. We preservationists have been fairly active in the last several years, and generally press coverage of the topic has improved during this time. There is certainly a lot of other activism in St. Louis, but the fact that the judges for this award selected a bunch of built environment blogs as the finalists gives me a slight glimmer of hope that the general public may be beginning to see the importance of the nature of the fabric that surrounds us has profound impacts upon us for better or for worse. Do we live in a place, something that someone would bother to stop and photograph or just stop ant take it in? Or do we live in a strip mall or another outlet center behind a 5 lane access road next to an interstate? Do you savor life and enjoy your surroundings as you move through them, or do you clench your teeth in frustration of the brake lights in front of you? You choose. Sometimes I look at photos like these and think that we have come a long way from the generations that came before us who before us. Today, usually we are discussing the pros and cons of losing one or a few buildings instead of entire swaths of our City like these shots of Mill Creek Valley (photos from the book This is Our St. Louis by Harry M. Hagen and the Western Historical Manuscript Collection). 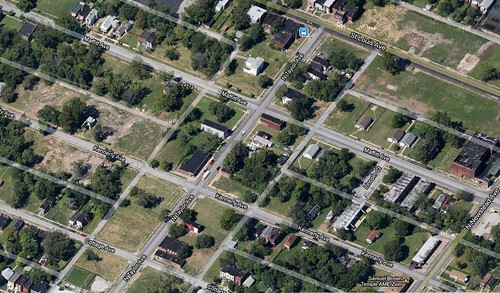 Then I look at Google maps and see scenes like these from the Jeff-Vander-Lou, Ville and Greater Ville neighborhoods where a very similar result has occured over the last 50 years and very much continues today, and I wonder how far we have come at all. Last week as a demolition crew was continuing demolition of the Powell Square building, local photographer Dan Wampler showed up at the site wearing a hard hat and managed to talk the crew foreman into letting him into the building to take some final photographs. Here is a selection of the photos he captured as he walked through the site and building with the foreman. The entire set of 81 photos can be viewed here on Dan's website. 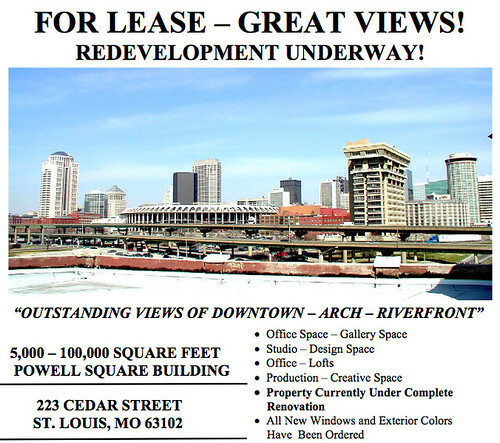 Great views of the Downtown St. Louis skyline and Gateway Arch gone to waste. A view east toward the now barely visible Mississippi. The 1952 addition has been completely cleared away. This photo shows a sample window that owner Steve Murphy had installed when he was attempting to put together a redevelopment of the building. Before we got involved as the architect for the proposed Chouteau's Landing Art Center, Murphy had apparently been ill-advised by a previous consultant that he should proceed with removing the windows from the building. Foolishly, the former plans had not considered the possibility of using historic tax credits. Removing the windows made it impossible to list the building as a single site on the National Register due to loss if integrity, and probably sealed the building's ultimate fate. 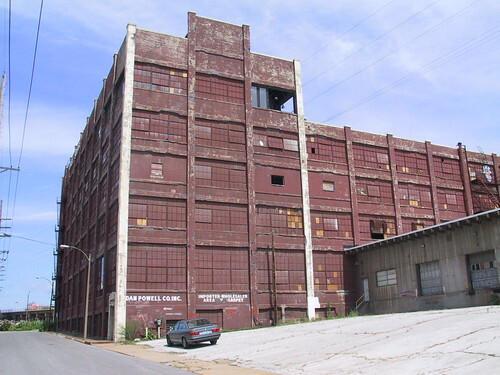 While even with historic tax credits financing the Chouteau's Landing Art Center may not have occurred, having the building listed on the National Register would have prevented the City of St. Louis from committing wonton demolition based on aesthetic issues. Last Thursday, the City of St. Louis commenced demolition of the Powell Square Building at 217 Cedar Street in Chouteau's Landing south of the Arch grounds. As the video above from KMOV Channel 4 points out, the City hired the demolition contractor for the sum of $265,000.00 of taxpayer money to demolish the building and will bill Steve Murphy, the buildings owner in hopes of recouping the cash. If Murphy does not (or cannot) pay, the City will add the sum to his tax bill. If the amount is not paid in 3 years, then the City will sell the vacant property at a courthouse auction. If no one bids, then the City ends up with the vacant land... because there is apparently a coming shortage of City owned vacant land! The Powell Square Building was constructed in 1916 as the headquarters for the John T. Milliken Pharmaceutical and Absorbent Cotton Plant. When Mr. Milliken died from pneumonia three years later, he was said to be the richest man in St. Louis. The buildings architect was William Wedemeyer, who's architectural firm is the predecessor of Wedemeyer-Cernick-Corrubia, which still operates today. The Milliken Pharmaceutical and Absorbent Cotton Plant was differentiated from most industrial buildings in that it was constructed completely of reinforced concrete, with no brick infills and almost no ornamentation whatsoever. This was particularly unusual in St. Louis, a city that was so dominated by brick masonry construction. The Milliken building was preceded only by the Luyties Homeopathic Pharmaceutical Building at 4200 Laclede a year earlier in 1915 as the first building constructed in St. Louis entirely of reinforced concrete. The crenelated all-concrete addition to the Crumden-Martin complex by tom Barnett, located kitty corner to the Milliken building at 2nd & Cedar, would be built four years later in 1920. 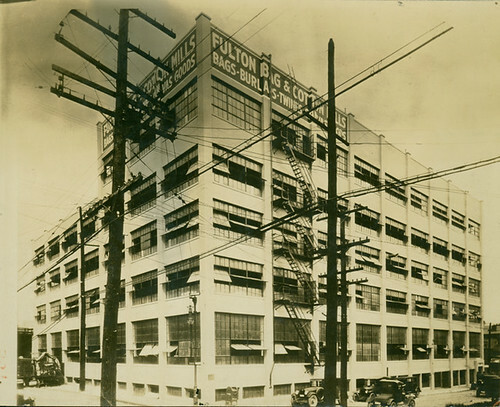 In 1926, the building was purchased by the Fulton Bag and Cotton Mill Company. The transaction was unusual in that as part of Fulton Bag's payment for the building on Cedar, their former building at 12 South Seventh Street was transferred to Milliken Pharmaceutical, who moved into the building and remained for several years. The building on South Seventh still stands and was renovated several years as the Fulton Bag Lofts. Photo above ca. 1930 from the Georgia Institute of Technology. In 1952 Fulton Bag added the truck dock addition to the east side of the building, also completely constructed of formed concrete. in 1956, Fulton Bag moved to a new building constructed for the company on Gustine Avenue. General Fibre Company purchased the former Milliken plant in 1957 and occupied the building for several years. Between that time and 2001, the building had numerous owners/tenants, one of which was the Dan Powell Co. Inc., which gave the building its current name Powell Square. The formed concrete entrance surround with its low sloped pediment was the only portion of the building that could be considered ornamented. In 2001 Steve Murphy, a lawyer and partner at the firm Devereaux Murphy in Clayton, purchased the Powell Square building as part of a larger assemblage of buildings in Chouteau's Landing and along South Fourth Street on the western edge of the district. Murphy's acquisitions included the Crumden-Martin warehouse #5 which suffered from a fire in December 2011 that damaged the roof and upper two floors. Murphy formed Chivvis Development to begin the re-development of the buildings along South Fourth Street to create a gateway to larger developments east of I-55. He succeeded in completing renovations of a 2-story building at 756 South Fourth Street and a 3-story building at 904-908 South Fourth Street, which was shortened by the construction of the MacAurthur Bridge between 1909 and 1917. 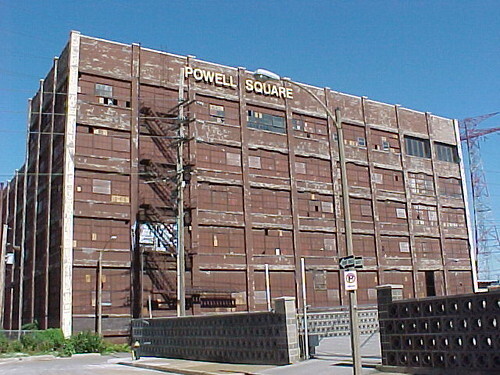 Murphy began advertising the Powell Square for lease as white-box space suitable for office, studio or production space. Below is a portion of a brochure from Hilliker Corporation promoting the building. The claim that the property was "currently under complete renovation" were a bit pre-mature. Photos above from 2003. 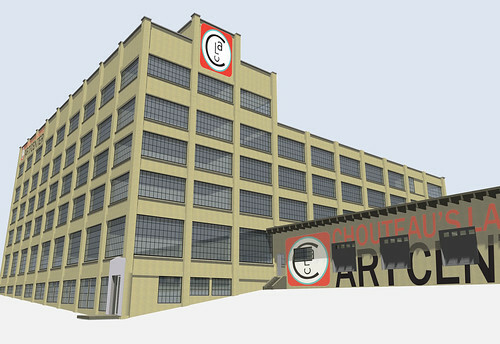 On a trip to Alexandria, Murphy and his wife visited the Torpedo Factory Art Center and were immediately inspired to bring the idea back to St. Louis, and thus was born the idea for the Chouteau's Landing Art Center (CLAC). The Powell Square building seemed a perfect fit for the concept which includes artist studios available for rent and open to the public, galleries, art classes, event space rental and more. I had the pleasure of working with Murphy as the architect for of this project with ebersoldt + associates architecture in 2008 & 2009. Below were the conceptual plans for the renovation. 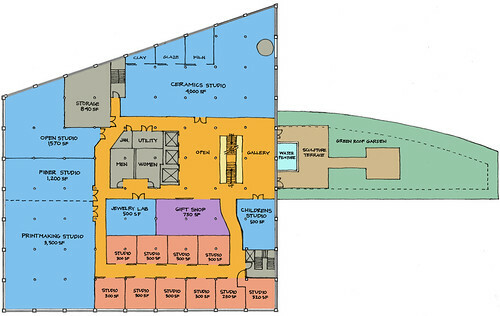 The first floor of the CLAC would have contained galleries, a large open event space, a glass blowing studio, a cafe and a small art supply store. The exterior would have included a sculpture terrace and garden. A separate small foundry building and additional public parking would have bee built north of the adjacent railroad trestle. 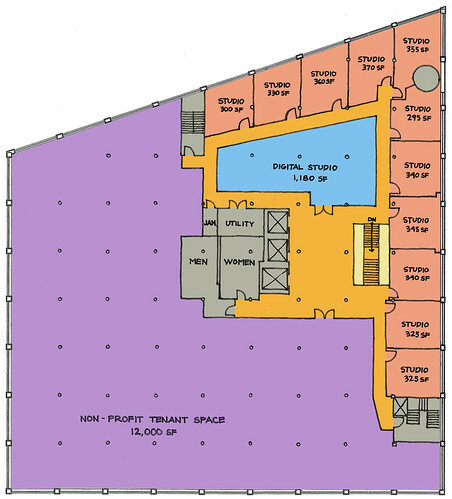 The basement would have had accessible parking, parking for some artist tenants and staff as well as storage. 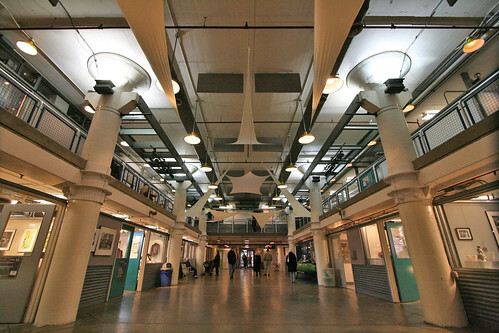 The second floor would have included classroom studios for ceramics, painting, fiber, jewelry, children's art, a small gift shop, artist studios open to the public, as well as a small terrace and green rooftop sculpture garden atop the 1952 addition. Murphy had secured a letter of intent from the International Photography Hall of Fame to occupy a large tenant space on the third floor. The IPHF is a museum currently located in Oklahoma City that has an extensive permanent collection of photographic images from notable photographers, a collection of historic photographic equipment and a library. The IPHF also hosts special exhibitions focusing on the art and science of photography. The IPHF is still moving to St. Louis, and will be opening later this year in Grand Center. 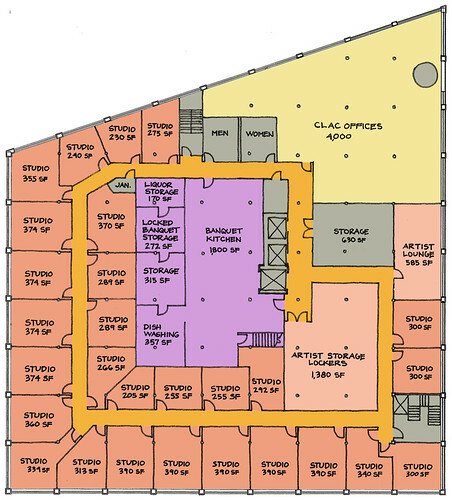 The third floor of the CLAC would have also included a digital studio and more artist studios open to the public. 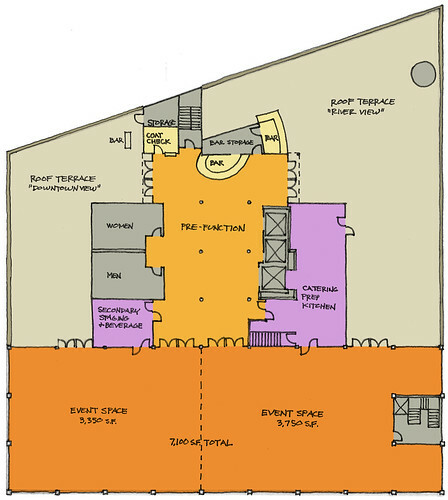 The fourth floor would have contained offices for the CLAC, rental artist studio spaces that would only be open to the public on a periodic basis and a banquet kitchen to serve the event spaces. 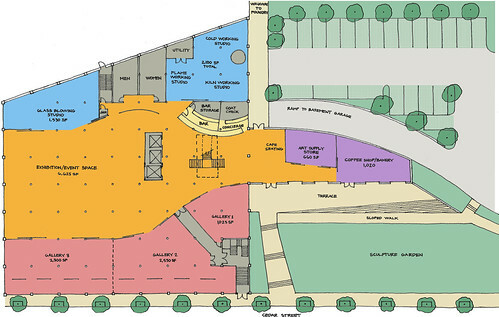 The fifth floor for the CLAC would have been devoted to event space opening to rooftop terraces with panoramic views of Downtown and the river. The Murphy's were very excited to bring this type of facility to Chouteau's Landing. 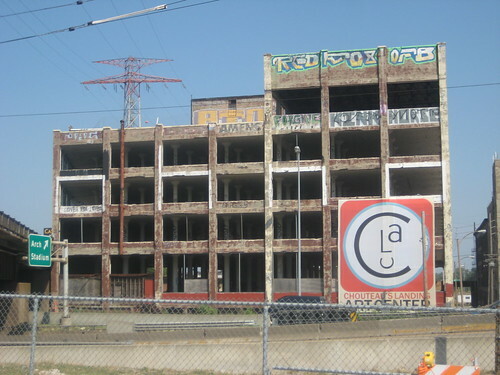 They saw this project as being the gateway and the draw for ordinary people to finally discover the hidden gem that is Chouteau's Landing, and planned further developments including artist live-work lofts as well as traditional loft condos and apartments in additional buildings including Crumden-Martin #5. They were aware that overcoming the urban planning disasters that had isolated this district would be difficult at best, but we all were confident that locating the CLAC in the very visible Powell Square building could be a key factor in bringing people to Chouteau's Landing. 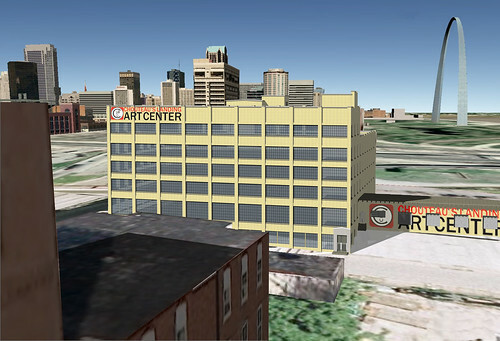 While a much smaller facility, the Foundry Art Center exists in St. Charles just north of the historic downtown shopping district, and components of the concept can be found at Craft Alliance and Third Degree Glass, no such facility of this scale bringing all of these ingredients together exists in the St. Louis area. These were some initial concept renderings for the exterior of the building. We did several studies with one color, combinations of color and application of the CLAC logo but were not overly thrilled with most of them. Very aware of the buildings use as a canvas for street artists, we also considered the possibility for commissioning one or possible several artists to apply their handiwork to various portions of the building. This idea would have had to have been carefully handled as we were also aware that some considered this aspect of the building to be a notorious and very visible eyesore. While the idea for the Chouteau's Landing Art Center was great, the timing however could not have been much worse. With the financial crash of 2008, we heard that Murphy had lost a good amount of personal equity, but he continued to try to make the project work. By 2009, the lending market had evaporated and finding someone to fund a project of this size without guaranteed revenues was nearly impossible. By the end of 2009, it was obvious that the CLAC was dead. Beyond financial issues, one of Murphy's major mistakes with Powell Square was pre-maturely removing all of the buildings original windows. To many, this made the building look like an eyesore. It also made the historic structure much more difficult to have listed on the National Register of Historic Places, which would have made a renovation eligible for historic tax credits. An initial eligibility assessment was done, but turned down due to the loss of historic integrity. The building could have likely been included as a contributing element to a larger historic district encompassing much of Chouteau's Landing, but unfortunately this was not pursued. 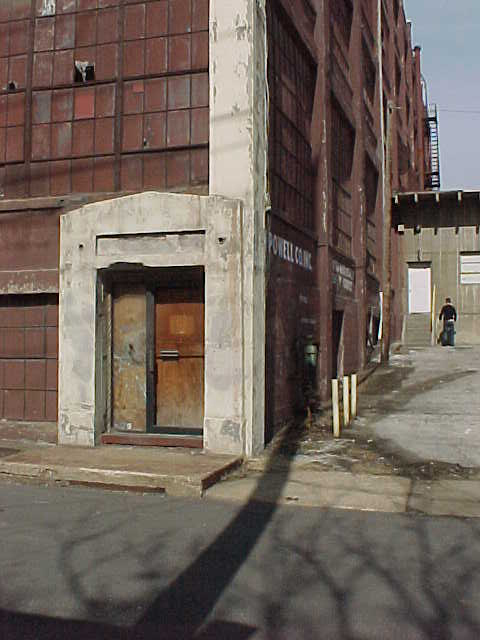 Throughout the development process, the City of St. Louis was pressuring murphy to do something to improve the appearance of the building. 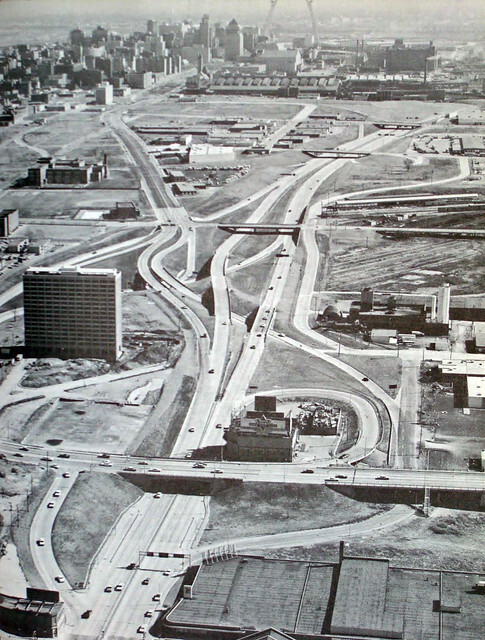 It seemed obvious that this was largely due to the buildings prominent visibility to people coming into St. Louis or leaving across the PSB and passing the building on I-55. At one point, the City seemed poised to assist Murphy with an exterior clean-up of the building, but apparently the money never came through. Three years later though, the City condemned the building and seems to have no problem burning $265,000 to demolish it. In 2010, artist Peat Wollaeger painted a large "I heart STL" on one of the more visible sections of the building. He had a vision that instead of cleaning the building, it could become an artists colony like the graffiti covered 5 Pointz Art Center in New York City. Here is the full story from the Post-Dispatch. This plan unfortunately never took off. 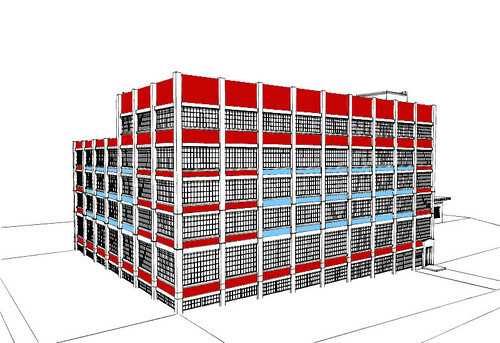 This fall, the Powell Square building could have found a new alternative lease on life with an idea from Vincent Stemmler to turn the building into a vertical farm. This idea apparently had Murphy's support, and was trying to gain funding on Rally St. Louis. 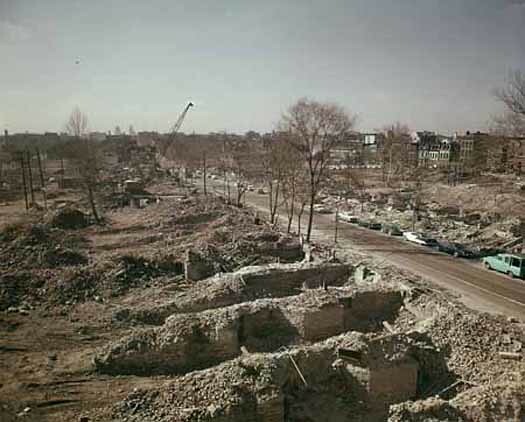 Even as the City of St. Louis is finalizing a City-wide sustainability plan which calls for reducing demolitions and supporting sustainable practice, which this certainly would have been, they went ahead with demolition of Powell Square. This also begs the question: Does every old industrial or office building need to have a $20 million+ rehabilitation to be considered a successful redevelopment? If so, then we should expect to lose many more of these buildings in the future as well as end up with a lot more vacant land. Is this a better "welcome to St. Louis"?